I was away from my kitchen for the first part of the month. We were on holiday in Epirus, northern Greece, in the Pindos mountains, an area known as Zagoria. 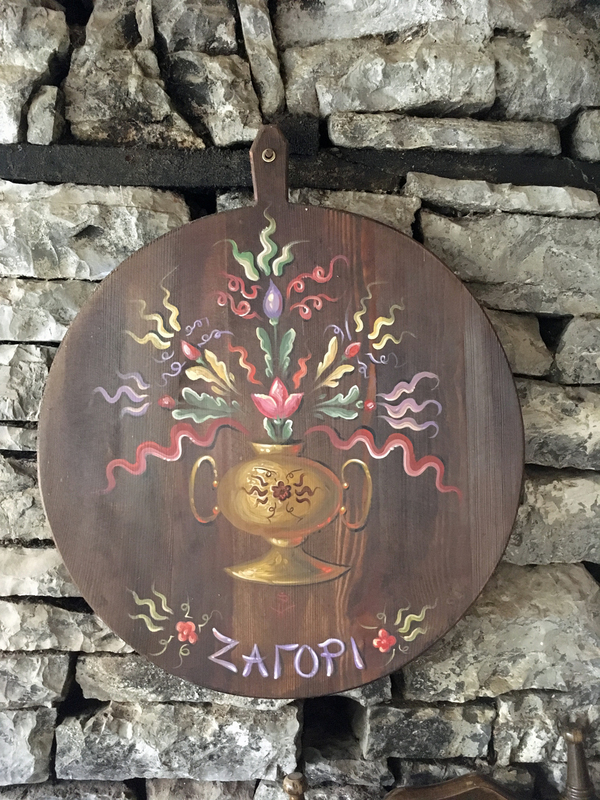 Just to remind us where we were, painted folk art on a plastiri (πλαστήρι), a traditional round board for rolling out thin sheets of homemade phyllo, spells it out. Not only was it pretty, it was symbolic of one of the notable culinary elements of Zagori food – the pita or pie, often made with homemade phyllo. I have two recipes for pies from this region to share when I get the chance – blatsaria (μπλατσαριά) and tembelopita (τεμπελόπιτα) – although neither of these uses phyllo. 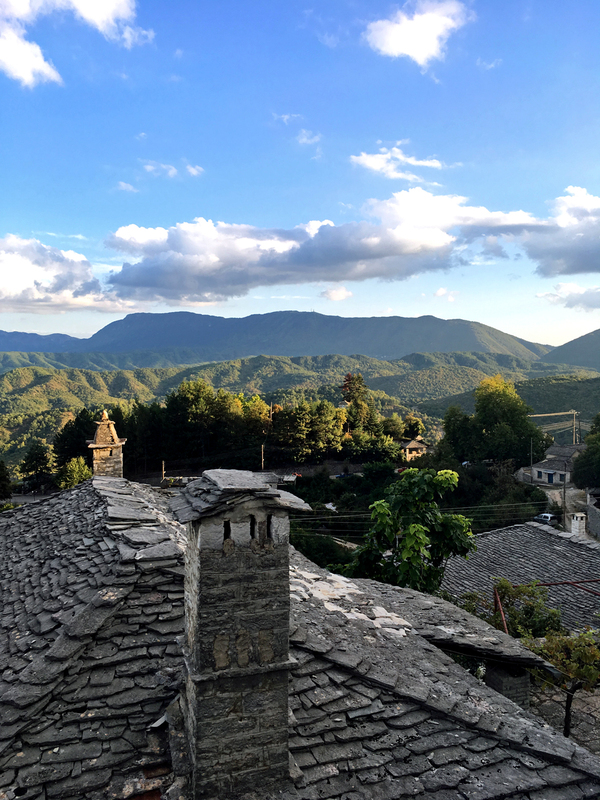 We were staying in the central Zagori village of Vitsa with its mountain views and stone roofs. Rhythms of life in the mountain villages begin with the morning bread delivery in the van. 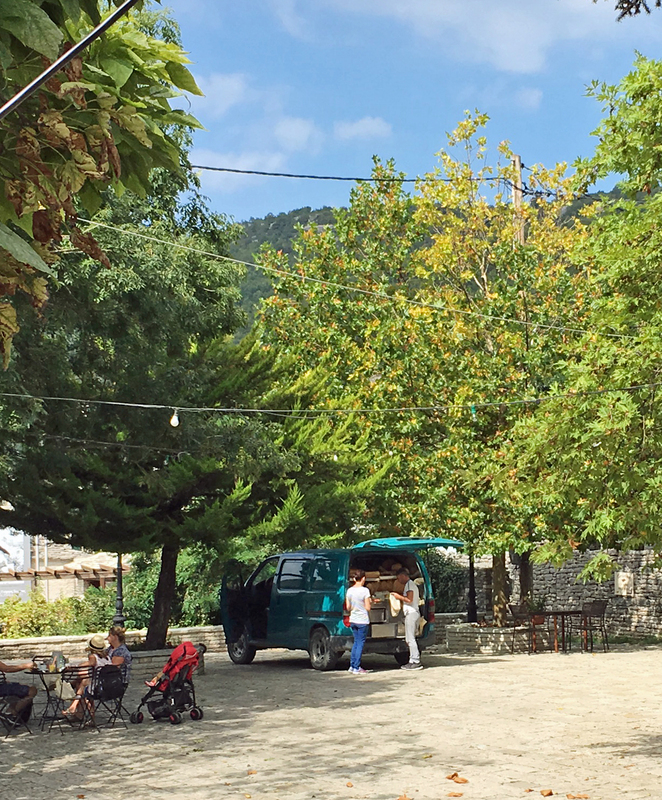 After seeing the van, I began to look for bakeries in all the villages we visited – none. I wonder where he comes from? We had many memorable meals, some in plateias shaded with wide plane trees. 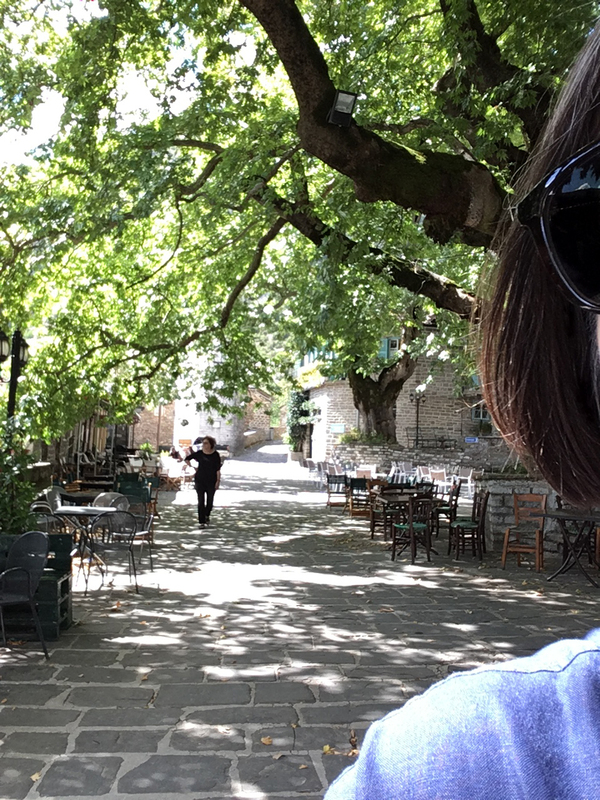 Taking the photo over my shoulder of the lovely plateia of Tsepelovo with its two plane trees. We arrived at half-day closing and the only place to eat was the local coffee and sweet shop. Excellent coffee and exceptional orange pie (for which I keep meaning to post a recipe). It was a very hospitable place. We will be back. Invariably meals consisted of pitas made with mushrooms (for which the area is noted), greens or cheese. Also on offer were giant beans (gigantes) made the Epirote way with greens. Lamb was prominent – cooked using a variety of methods (stewed, grilled, slow-cooked in clay pots or grease-proof paper) and marked on the menu by its age (1 year, 2 year…). 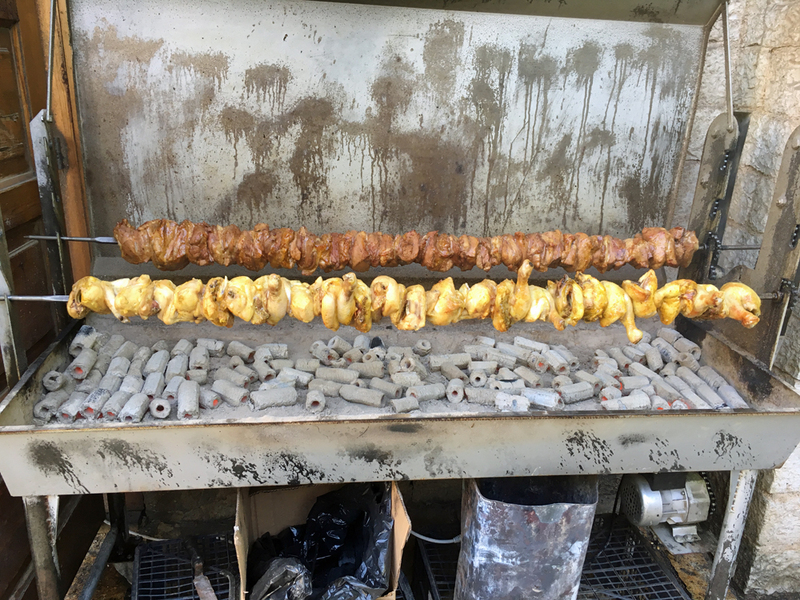 BBQ chicken and kontosouvli – the latter a rotisary style souvlaki with larger chunks of meat – also feature heavily in the local diet. 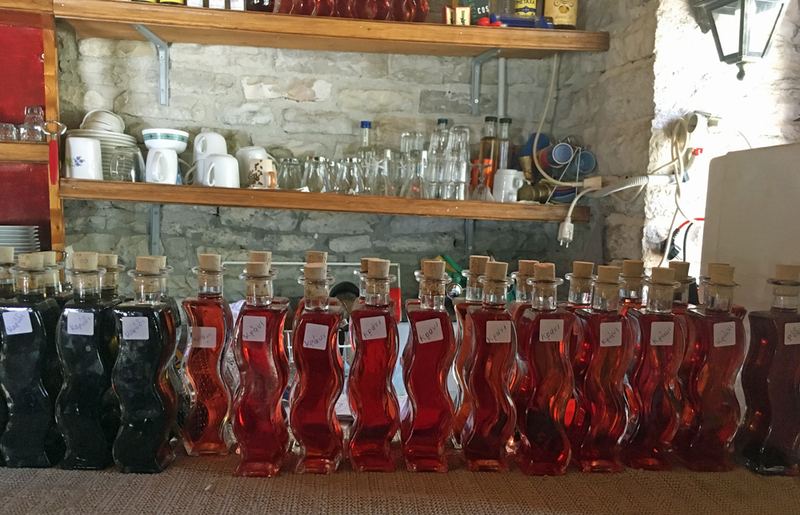 Visiting various villages we stocked up with food to transport south: wine and tsiporo (a grappa-like fire-water), goat, sheep and smoked Metzovoni cheeses, corn meal (difficult to source in the south of the country) and sweet liqueur made with wild cornelian cherry – krana (κράνα) – that grow in abundance in the surrounding woodlands. The other (polished) used as a decorative piece, with two dozen silk roses. Still need to figure out how to arrange them so they don’t flop around. Also, Eporite textiles for the kitchen or dining room fit into the luggage easily. 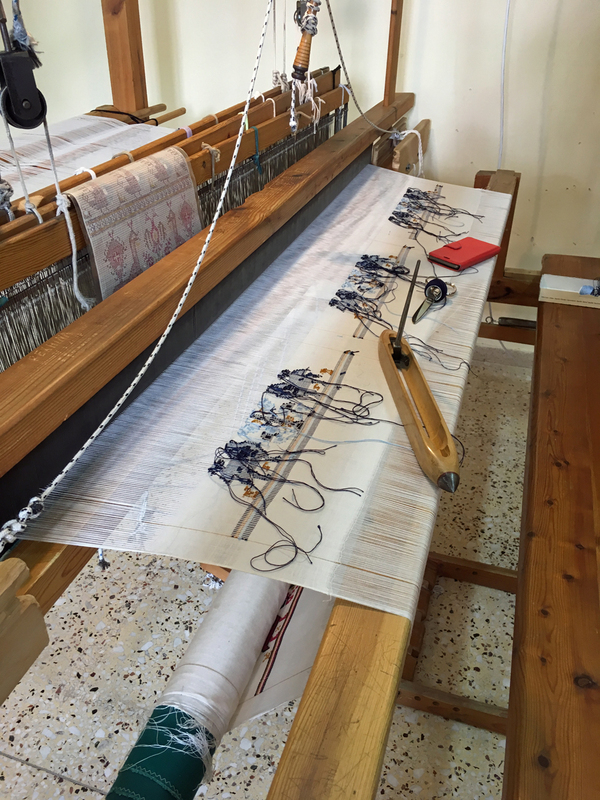 In the village of Monodendri, the Rizareio school of traditional textile work has a shop selling hand embroidered tablecloths, napkins, table runners, etc. 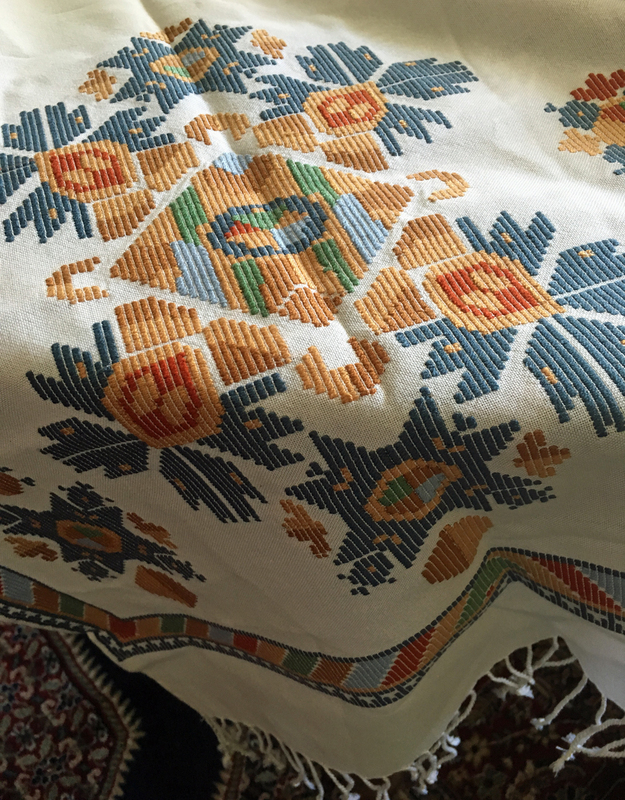 And typical of the area were the hand woven cotton pieces, embroidered during the process of looming. At the school in one of the looming rooms, the numerous coloured threads are stitched after each passing of the weft thread on the shuttle through the “shed” (the space created by the warp yarns drawn into two layers) and beating the thread into the “fell” (the line of termination of the woven fabric where the last weft yarn was beaten-up). Note the pattern taped to one of the loom’s wooden beams. 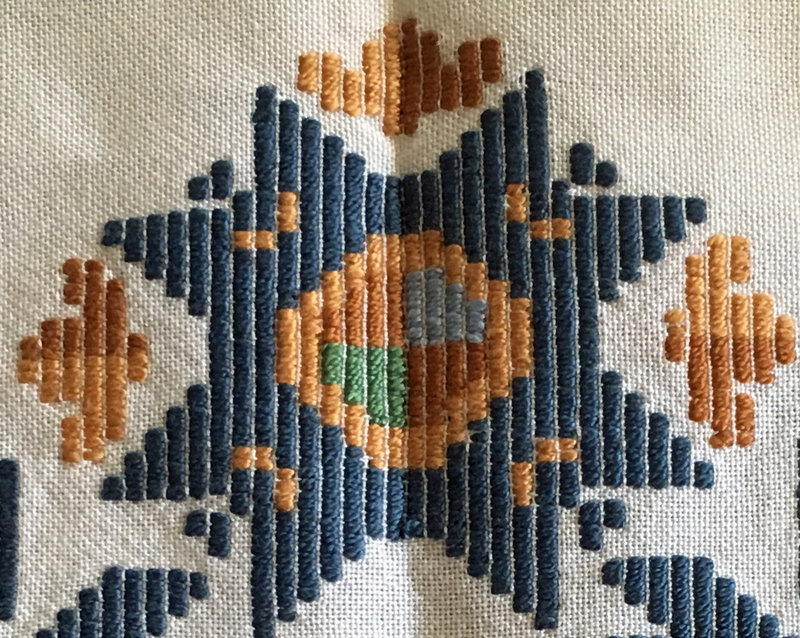 Detail showing the stitches on my piece. After being in Athens for only a few days, we headed to Sicily for a wedding. Naturally, we celebrated with food. Granitas were consumed whenever possible – particularly the prised gelsi (mulberry) or pistachio flavours or those granites made with different sorts of almonds. 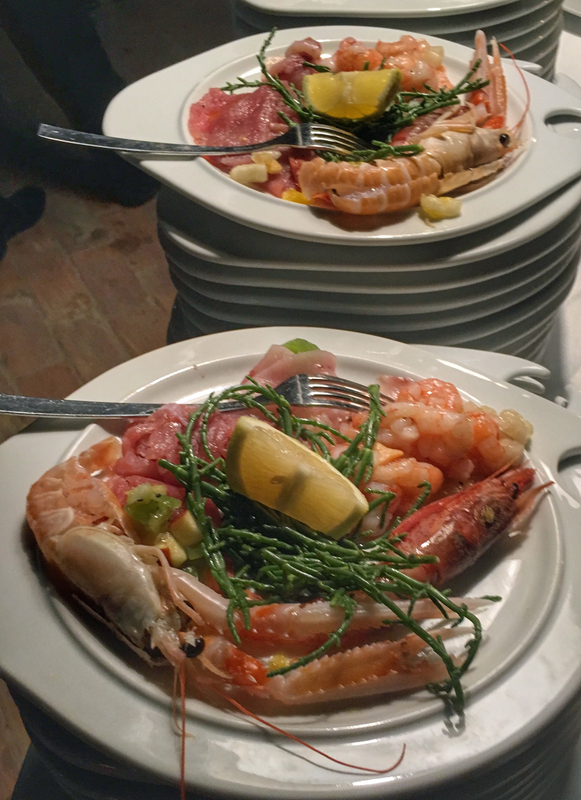 The wedding feast began with frutti di mare and ended with fruit tarts and sweet cakes. The dinner in between was spectacular – as you can tell from the menu. Returning yet again to my Athens kitchen, we brought bounty. 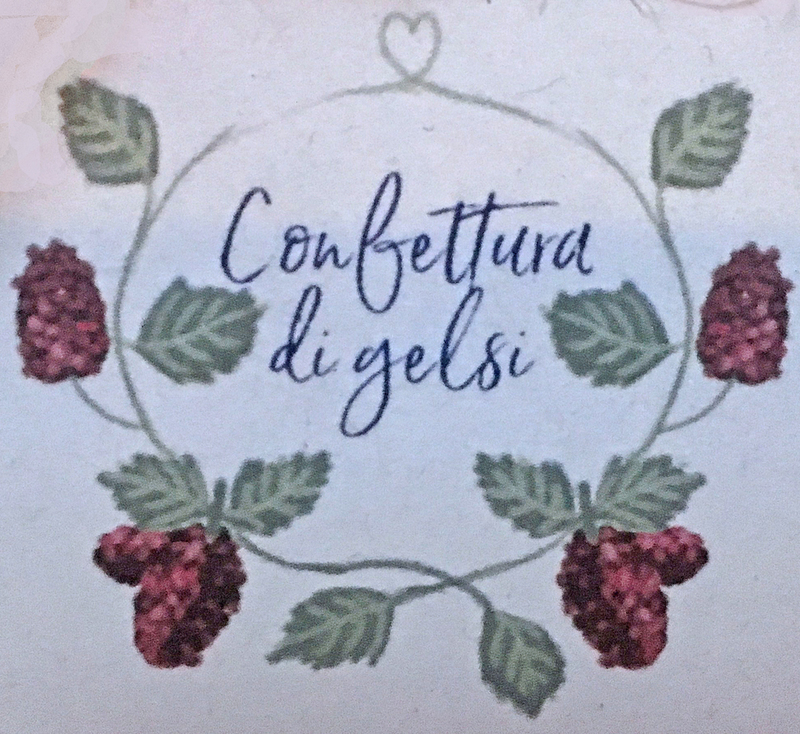 Favours from the wedding were jars of delicious confittura di gelsi (mulberry jam), plus we stocked up on goodies from Nonna Vincenza’s deli on the airport – sweet pistachio cream and pistachio pesto. 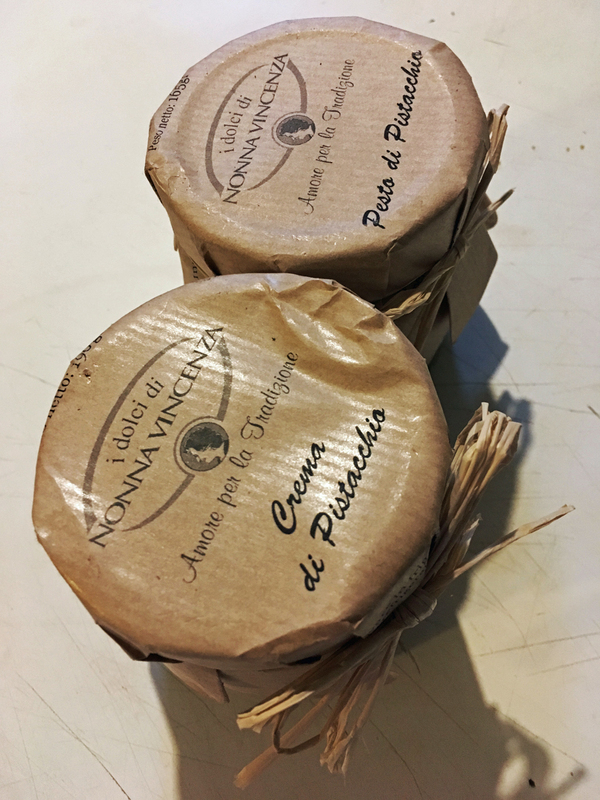 Two arancini ‘takeaway’ came back with us for our supper before we packed again for a quick turn around off to the Cycladic island Koufonisi for a few days – work this time. Yes, I know: nice work if you can get it! A short hop (very, very early in the a.m.) took us to Naxos to catch the ferry to Koufonisi. Here we had breakfast on Naxos harbour front. 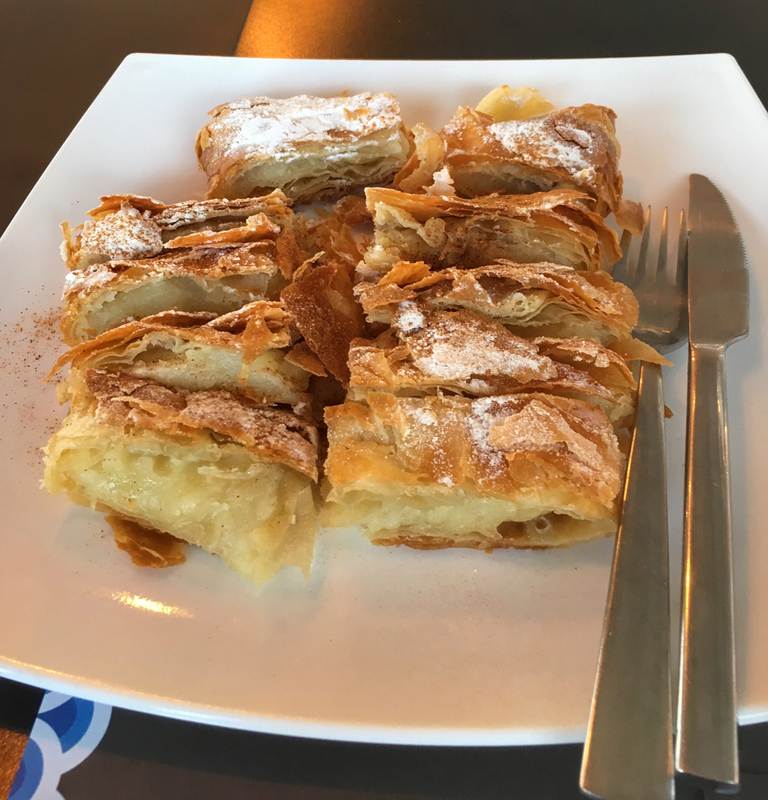 I’d forgotten those generous portions on the island: the bougatsa (a cream filled phyllo pastry) for one was enormous. 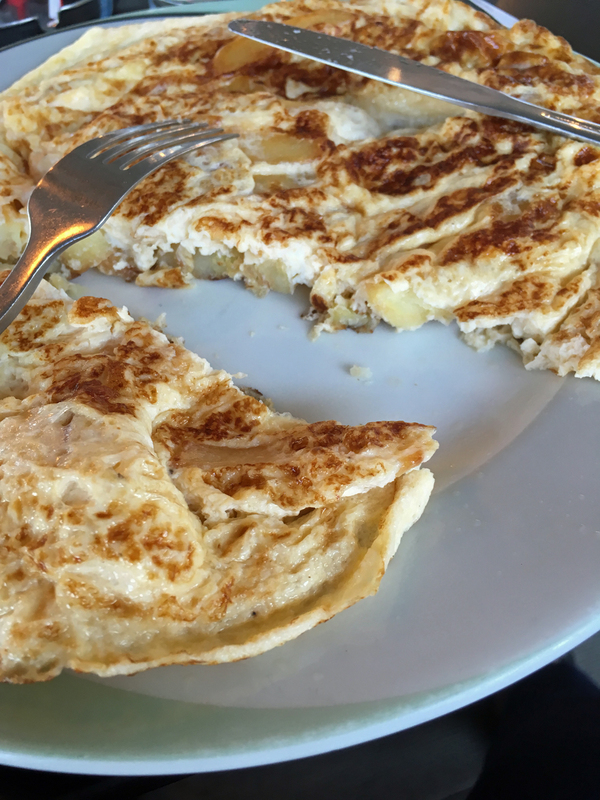 I had an equally huge fluffy omelette with Naxos potatoes (some of the best in Greece). The second half of the month was spent experimenting in my Athens kitchen, inspired by our recent experiences: pitas from Epirus, pistachio and almond sorbets (granitas melt so quickly, so sorbet with a stabiliser is much more suited to our lifestyle), combinations of fish with bean salads (like the one I posted on two years ago) common in the Cycladic islands, sourcing Naxos potatoes in the market… Plus, we have all our foodstuffs from travelling to enjoy. It’s nice to be moored once again. A monthly IMK (In My Kitchen) post. 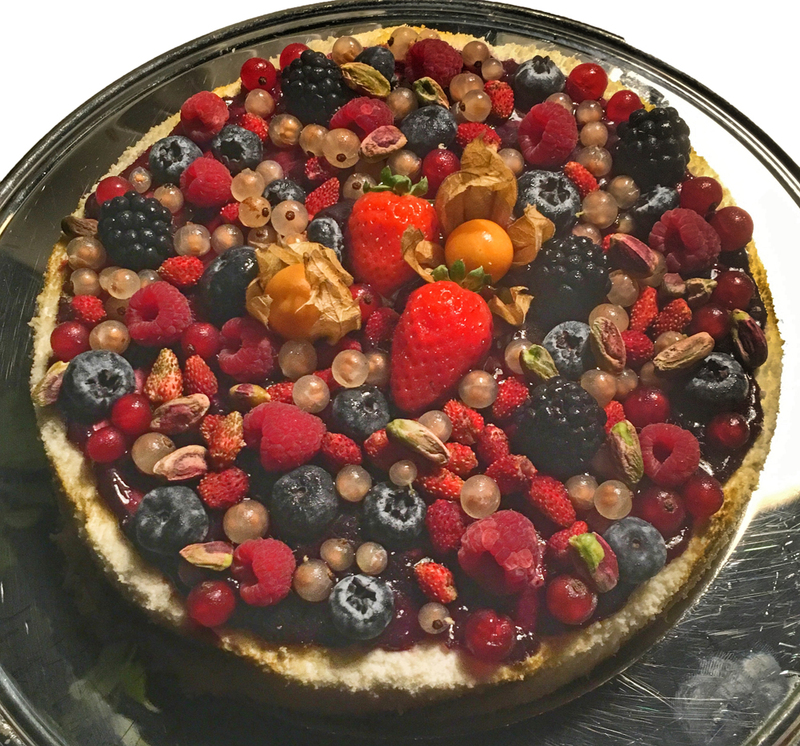 Check out other IMK bloggers, each of us writing about what’s been happening in our kitchens each month, hosted by Sherry @ Sherry’s Pickings. Earlier IMK posts can be found on former IMK host blogs: Liz @ Bizzy Lizzys Good Things, Maureen @ The Orgasmic Chef) and the fabulous Celia @ Fig Jam and Lime Cordial who began the IMK phenomenon. A chronological listing of my In My Kitchen blog posts can be found on a separate page, just click the link or look under the heading of Diaries in the Menu bar above. thank you for sharing your beautiful pictures from your holiday, it looks like it was amazing. I was amazing! Great food everywhere. A childish WOW! And thank you so much for such a different and rich IMK post !! Hard to know where to look: foodie that I am perchance that wedding menu takes the cake . . oh how I would love to taste the Sicilian citrus risotto with prawns . . . Life in Greece may be so complicated in the here-and-now – as a contrast it is great to see the rich sides of everyday life still able to be lived . . .
I’m starving now! And green with envy. Love those road trip—and loved the food in Sicily last year. But the sorbets I had were all lemon— delicious though. Am reblogging this for foodie friends. Re your roses, what about one of those blocks of foam where you can stick the ends in? The sort of crumbly ones. Maybe you can get one in a flower shop. I visited Zagori only once, I’m still in love with it. All those beautiful, elegant stone bridges…! I had the best xortopita of my life there – when I was finished I regretted not being hungry any longer, but I didn’t have any room left for another slice. I would go back in a split second! I am in love with the place, too! It really is wonderful, though rather hard on my leg muscles with all that up and down walking! A lovely post, yet once again making me wish for a visit to the Greek Isles. Thanks for sharing and I look forward to those pie recipes. Greek mountains are great and these are some of the best. Hope you do get to visit the country. A wonderfully greedy and evocative post. Now, please don’t forget to post all those recipes! Will try. Still trying to catch up after our perambulations. Plus, the academic year has started, so we’re now busy at home! Oh, in your own good time. Blogging’s meant to be a pleasure, not a chore. Just ignore me, I won’t keep on nagging. Doro I think that’s how you spell it. Also chocolate dipped butter cookies, and the piece de resistance a Melomakrona. OMG! It’s my favorite! I wish I had more. I’m going to find a Greek bakery to get some here. I thought it might be a macaroon based on the rona at the end of the name, but I was so wrong, but not disappointed. Tarpon Springs is the US Sponge capitol. I had no idea of it’s history until I went there, and of course I bought two sponges. A silk one for my face, and a wool one for the kitchen. Melomakrona are typical Christmas cookies here in Greece and a great favourite of mine, too. Koulourakia is the generic term for cookies, so it was probably called that; they are generally hard and come in many shapes. If you are interested in REAL Greek food, look up Diane Kochilas’ book The Glorious Foods of Greece. It is a great introduction. I’m wondering if the Hellas Bakery doesn’t offer the Melomakrona all year long? They were clearly marked and displayed as such, and there wasn’t a whole tray of of them like the other cookies were. These were in a covered glass cake stand on top of the cookie and pastry counter. There were so many cookies, and pastries for sale it was so hard to choose. It’s a huge bakery! 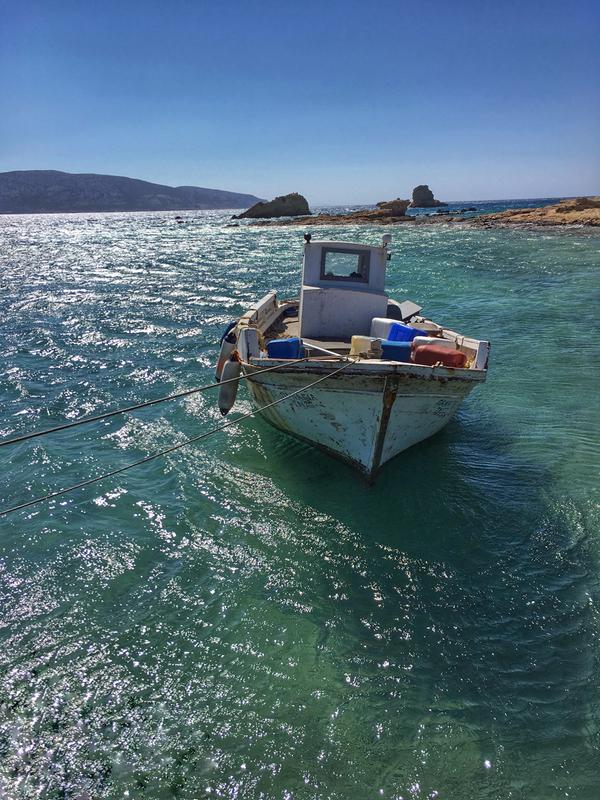 Greece is a great place to explore – particularly off the beaten path! Thanks Sherry. Travel is wonderful, but exhausting. And, I do love my copper pots. Debi, what a pleasure to meander through your post. I looked up your bean salad recipe (thanks!) and was surprised to see black-eyed peas (aka beans) featured — a Southern staple — sounds like a great side dish for fish. 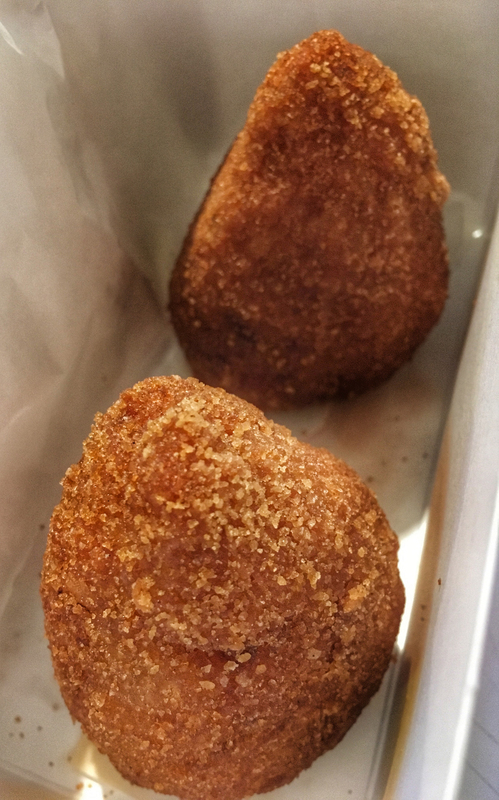 Also, those arancini piqued my interest… and appetite. 🙂 The wedding menu was spectacular and I was so glad you got to attend and enjoy. Thanks for sharing your adventures. 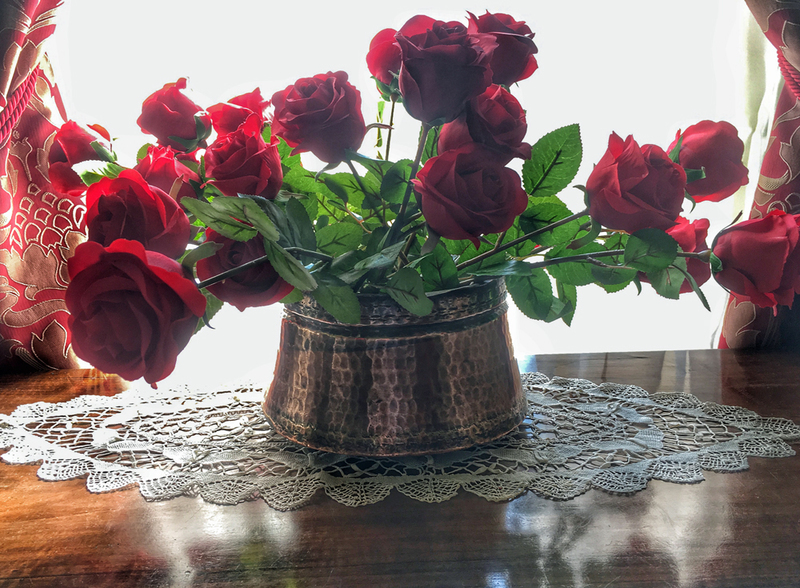 Re: the “floppy” silk roses, maybe cut down the stems a bit? 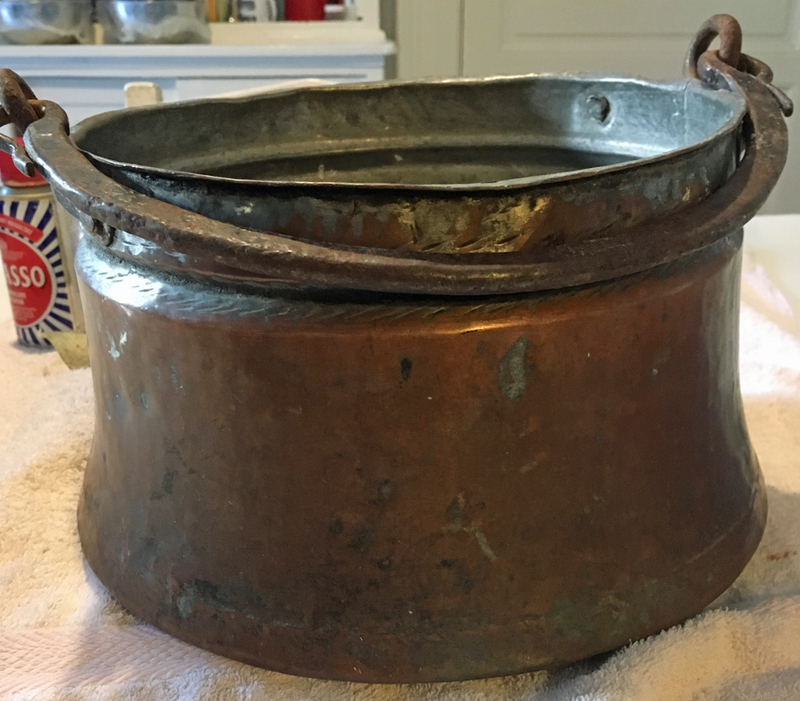 That copper pot is so pretty — show it off! Hi Kim, at least I am getting to these comments before my next IMK! The bean salad recipe is a keeper and very delicious. Black eyed peas are grown here in Greece and they favour them for salads. In fact, they grow a lot of beans and feature in many traditional dishes. The Sicilian wedding was fabulous and so much food! After eating our arancini (rice croquettes, often stuffed with cheese), I wish we had got more, but then it would have been glutenous. Your photos are amazing. Thanks for sharing. 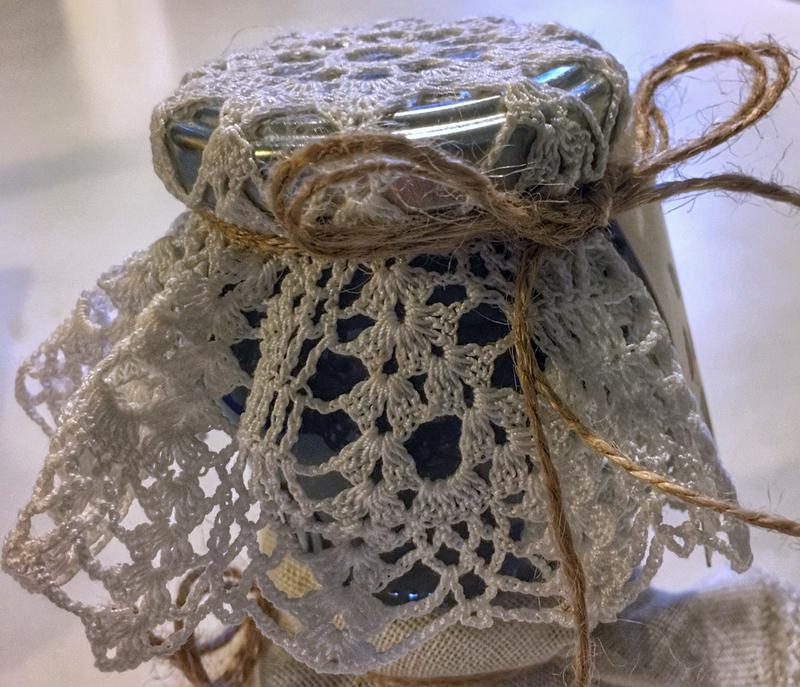 I love the recent trend of “wedding favor” being food items like that mulberry jam! I do like these edible wedding favours – and the bride’s favourite thing is mulberries. Your photos of the villages with the stone roofs and very blue skies are beautiful! Thanks, Mae, I did love being up there in the mountains, in those villages with the stone roofs. Lovely pictures, the one at the end of the boat made me want to jump in the water. Great treats you’ve had and brought back. I can imagine sitting on that terrace after just after a long trip, so relaxing and it says…You’ve arrived. Thanks, Liz, that picture of the boat on the water was so calming that I had to add it at the end. Took me a while to come up with an angle! Serious envy reading this blog post! I couldn’t believe we crammed in so much travel in the month. To be honest, it was exhausting as it was exciting. ooh… mulberries are in season here. I love them and have made a mulberry ice cream that is divine (if I do say so myself). I love those milk pails – how lucky you are to find them. When we camped in France a few summers back, a cheese van visited the campground every few days. The height of convenience. Perhaps the person with the bread van bakes in an oven oven at the back of his house? I love mulberries, too. I’ve dreaming of a mulberry sorbet, but your ice cream sounds delicious. And, I do love those copper pots!